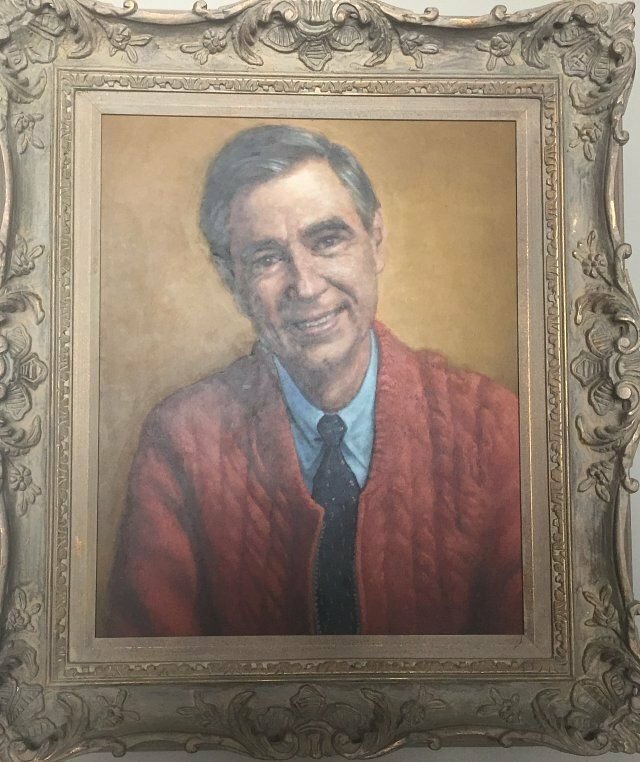 This portrait of Fred Rogers hangs at the top of the stairs entering our living room, which means I see it, and make eye contact with Fred, many times each day. Having Fred hanging there changes the molecules in the air of the place where we live. The artist who created it is another reason why that picture is one of my most cherished possessions. Bob Stuth-Wade is one of the Southwest’s most accomplished painters, and a man who rivals Fred himself in terms of human goodness. 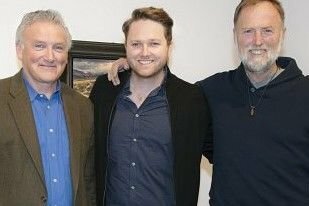 Bob and I met in 2014, when I was writing about his son, singer-songwriter Luke Wade, who was then electrifying American audiences on television’s The Voice. Fred came up in my first conversation with Bob, and we immediately agreed that the late icon of children’s television was a secular saint. A year later, at a Thai restaurant in Fort Worth, with wife, Wanda, and sons Luke and David, Bob unveiled his gift. For the first time, I saw Fred looking back at me from the canvas. Something about his eyes. 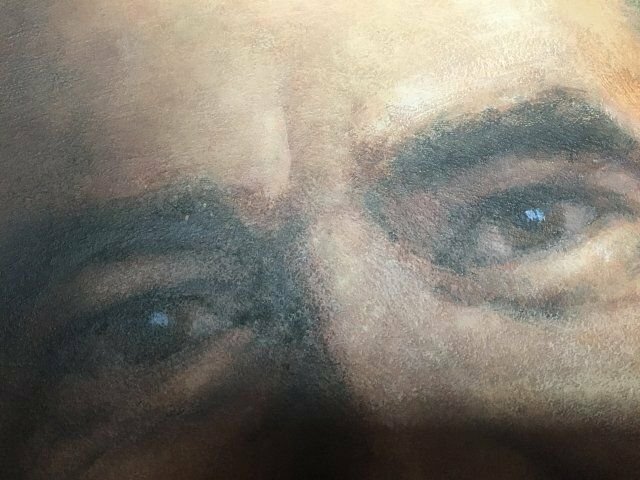 Which caused me recently wonder—how do you paint the eyes of Fred Rogers? I called Bob to find out. It turns out that Fred was not the first. For years, part of Bob’s spiritual practice (in addition to two hours of daily meditation and tai chi) was something he called “paint a saint.” He used his brush to try and capture the essence of human greatness on canvas. He painted Jesus and St. Therese of Lisieux, The Little Flower. He painted Gandhi and the Indian sage Ramana Maharsi. He sketched Lincoln. “On the internet, I would look up saints and enlightened people, and go through the images until something resonated with me, and touched my heart,” Bob said. “It’s that look in their eyes, something so subtle. It’s like they see how things really are. They are the love that the world is, and when I look at them, I feel they are seeing me as that same love. That’s the reason I painted them. That spark of life is what I was looking for. As I said, I met Luke in 2014. We talked about his star turn on The Voice, but I also found him to be a very thoughtful and soulful young man, and another admirer of Fred Rogers. I told Luke that I had known Fred well, and written a book about our friendship. A short time later, Luke shared our conversation with his dad. 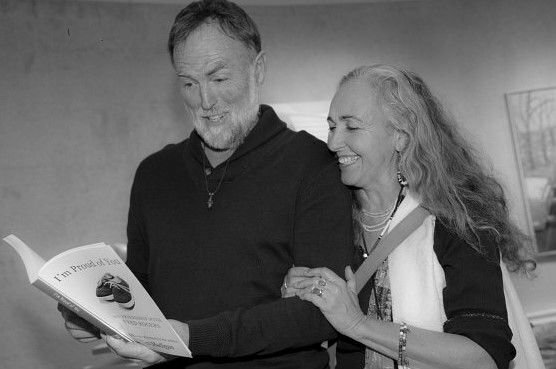 Bob and wife, Wanda, with a certain book. But Fred was not an easy subject, as saints go. He worked on the portrait in fits and starts, turning the painting toward the wall, setting it aside for several months at a time. “Finally, the last time I worked on it, I just dove in,” Bob said. In the end, of course, it was abou t the eyes. Not that it would help Bob finish Fred’s portrait. So as he studied photographs, Bob opened his heart to the eyes of Mister Rogers. Then came that sacred moment in his studio, after a few final dabs of his brush. “I felt him looking back at me,” Bob said. Finally. I see you. I see I.